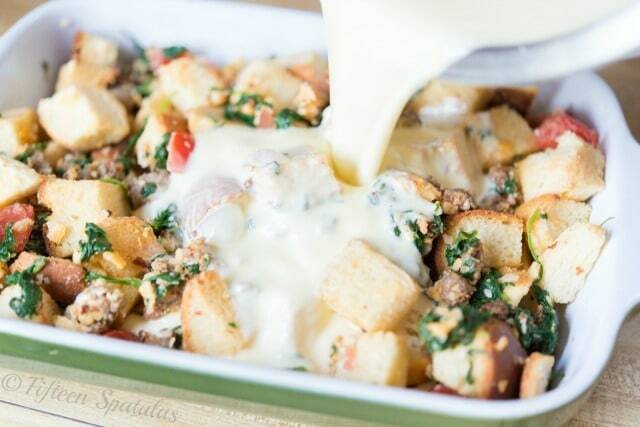 Sausage Breakfast Casserole - Make Ahead Overnight Recipe! You can assemble this Sausage Breakfast Casserole the night before you plan to serve it, and simply bake it in the morning for a hearty and delicious meal! Make-ahead meals are the best. Not everything can be made ahead of time, but thank goodness there are some meals that are even better because they’re made in advance. 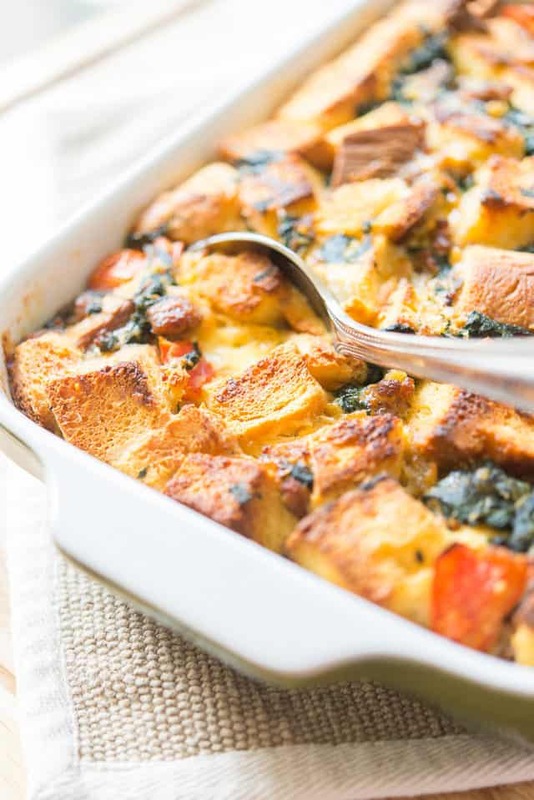 This Sausage & Spinach Breakfast Casserole is one of those meals! Here you assemble everything before you go to sleep, then all you have to do when you wake up is turn the oven on and bake. 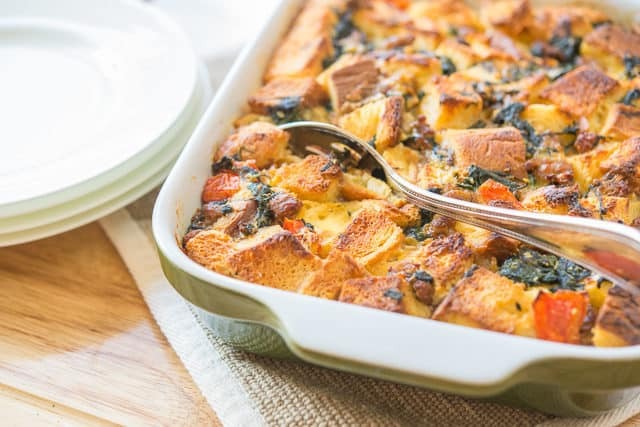 What you end up with is a big dish of eggy custard soaked bread dotted with sausage, cheese, spinach, and tomatoes, that you can scoop onto everyone’s plates. And if you happen to have leftovers, this dish reheats beautifully! 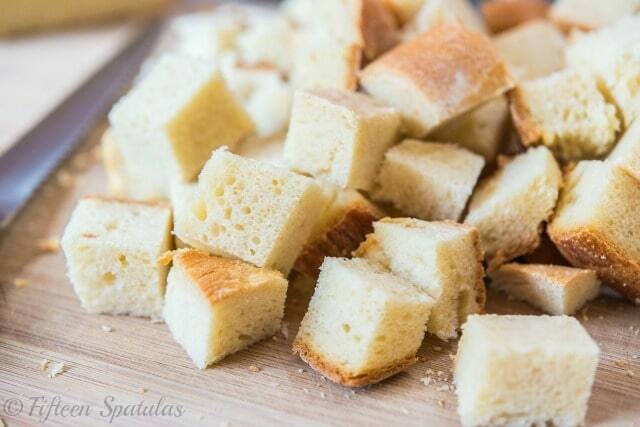 The first thing you want to do is cut up a good quality loaf of bread. Here I used my homemade Sandwich Bread, but you could also purchase a sourdough type loaf of sandwich bread. Try not to use breads that are really crusty. With this dish, you want the bread to be a day or two old (in other words, on the dry side) so the bread doesn’t get soggy. 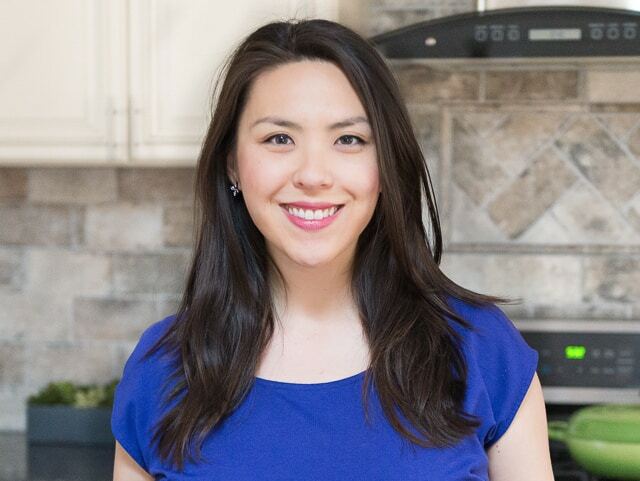 If you’re using fresh bread, you can dry it out a bit by toasting it in the oven (350 for 10 minutes or so, until the cubes are lightly golden). 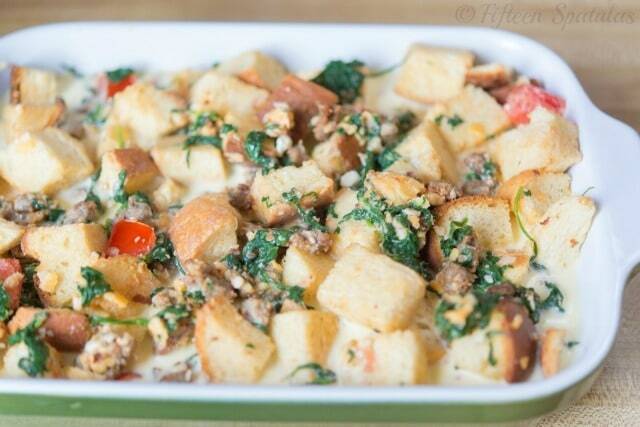 Place the cubed bread in a casserole dish along with cooked sausage, cooked spinach, diced tomatoes, and cheese. You will notice that the custard doesn’t soak immediately into the bread, but by the time you wake up in the morning, the liquid will be absorbed. Then in the morning, simply bake and eat! Crepes are another favorite breakfast, and the batter can be made the night before. I also love Buttermilk Pancakes and this Potato Frittata for something savory. Enjoy! Ingredient Substitutions: Feel free to play with the ingredients here. You can add bell peppers, sauteed mushrooms, or other favorite ingredients instead of spinach and tomato. Enjoy! Can Breakfast Casserole be frozen? You may freeze leftovers for up to two months. Can Breakfast Casserole be reheated? Yes, I recommend doing it in the oven. The microwave will give you a soggy texture. 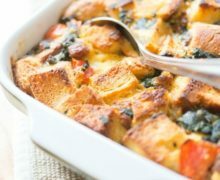 Assemble this breakfast casserole the night before you plan to serve it, and simply bake it in the morning for a hearty and delicious meal! Butter an 8×12 casserole dish, and set it aside. In a large bowl, combine the cooked sausage, cubed bread, cheddar, spinach, and tomatoes, and toss together well until evenly distributed. Pour this mixture into the buttered casserole dish. Cover the casserole dish with plastic wrap or foil and store in the fridge overnight, or for up to 18 hours. When you wake up in the morning, preheat the oven to 350 degrees F and bake the casserole for 1 hour until the custard has set and the top is golden brown. Serve and enjoy! Post updated in November 2018. Originally published September 2013. I love make ahead breakfast casserole! The Italian sausage sounds like a wonderful addition!! What a great looking stratta. One of our favorites! This looks so delicious! I love make-ahead meals. Thank you for your posting today. I was so sick of cyber-Monday and I can’t tell you how nice it was to read through your recipes and commentary. It was truly a salve for my shopped-out mind! Lovely pictures, not a sale! anywhere, and, oh yes, some interesting recipes, to boot. 🙂 Bless you. So glad to hear that Rinda! I stayed away from Black Friday and Cyber Monday, haha. Glad the recipes cheered you up. Happy Holidays!